Carol Cleveland may indeed be best remembered for her appearances with the Monty Python team, on TV, in all their films and stage shows; she was, however, always more of a stooge than a full member of the team, and often given roles merely emphasising her physical attributes. 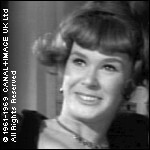 But she actually had a more extensive acting CV than any of the Pythons themselves: starting with episodes of The Saint (1963) and The Sentimental Agent (1964), she was frequently in the ITC series, often playing Americans, while minor film roles included Chaplin's swansong, A Countess from Hong Kong. Utter trivia: in two for ITC, Man In a Suitcase, "The Sitting Pigeon" (1967) and Randall and Hopkirk (Deceased), "For the Girl Who Has Everything" (1969), she was wearing the same dress. And she said in an interview that her best work was in The Lotus Eaters, an early 70's BBC series with "a wonderful actor named Ian Hendry." She has been less visible recently, and is reputedly thinking of leaving Britain, although she did appear in some of the new material in Python Night, the recent BBC2 all-Python evening. The Pythons always hailed the Goons as a major influence—in 1972, that team reunited for The Last Goon Show Of All. Spike Milligan later went on record as saying that show was not their idea but the BBC's, and was "forced"; I have a feeling the same applied to Python Night.